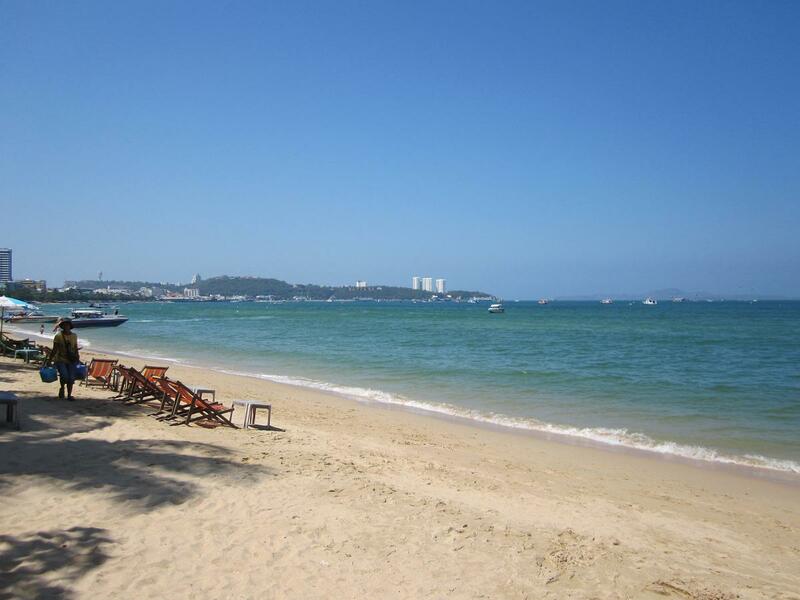 On 13th March 2010, me and my husband planned to hangout to a famous but crowded beach of Thailand called the “Pattaya Beach”. It is about 2hours 30min drive from the Bangkok city by bus. Taxi usually takes one and a half hour. We bought Ekamai-Pattaya tickets from ROONG REUANG COACH CO, LTD (02) 712-3928, rrc_bus@hotmail.com, for 113THB (Thai Baht) per head. Our bus began to move at 9:50 am and so we started our journey by the Name of Allah.. I was sleepy so I had slept all the way as the bus was on highway and the journey was smooth. I woke up when the bus entered into the busy roads of Pattaya city. The city looked busy, full of hustle and bustle. We reached the bus stop at about 1:00pm when the sun rays were at its peak but thanks to our sunglasses and hats which kept us protected to some extent. Pattaya city was a completely new place for us to visit besides we didn’t even know Thai language except for the greetings like Swade Kaa(welcome) and Kapun Kaaa(thank you). My husband went to a nearby tourist guide office to get some information but came out with a few brochures and maps because the tourist office were trading their offers for very high price thinking us to be aliens in Pattaya city. But anyhow we managed to sit in a Taxi called the “TUK TUK” in local language for about 30THB per head. Our booking was already done in a famous hotel of Pattaya called the “All seasons Hotel” 425/9 MOO.9 Pattaya 2nd road, central Pattaya chonburi Thailand 20150. Tel: +66(0)38418888, http://www.accorhotels.com/6525. The Tuk Tuk dropped us in our hotel which looked rather busier then we expected. A lot of Indians and Chinese families were checking in and out. The interior of the hotel looked cozy and innovative. We checked in and went into our room. The view was great from the room. One could easily see the beach view, the sailing boats and sea sports. Watching all this, our patience could not be restrained any more for touching the sand of the beach but still we tried spending a few more hours inside the room waiting for the scorching sun to go down so that we could go to the beach which was just 15min by walk from our hotel. After the sun went a little down at about 4:30pm we took our way to the Pattaya beach. Crossing some lanes we reached our destination. This place was over crowded. The road adjacent to the beach is always jam packed with Tuk Tuk’s and local cars with a lot of Bikini and small accessories shop in a row. Beach view is good but, beware! not to leave your eatables beside you while enjoying the sand and water coz there are a lot of stray dogs wandering around in search of something to eat. 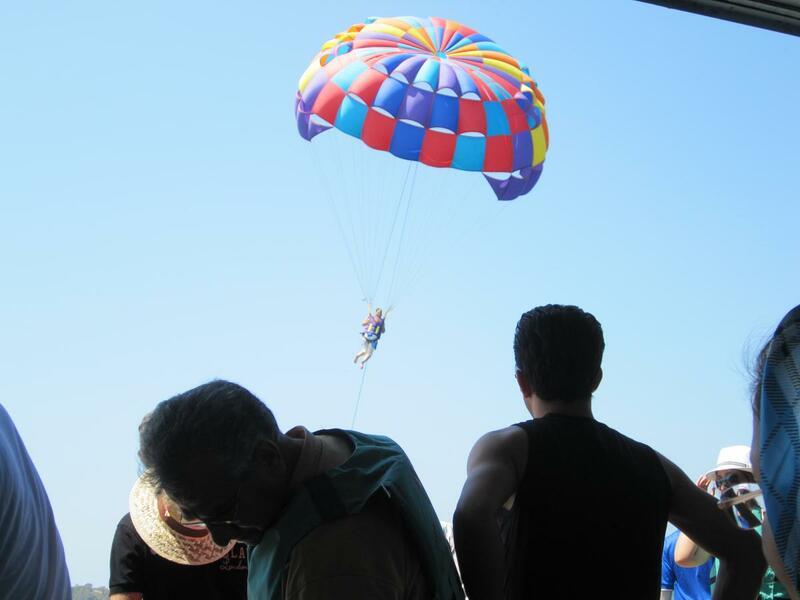 My husband was interested in parasailing (water parachute sport) so we went on asking different people about the prices and procedure.. There were many water sports going around too which caught the sight of many people gathered around the beach. It was getting cooler and darker at the beach as the sun was setting. We relaxed at the beach side with some drinks and ice creams and took a few memorable snaps. It was getting darker now so we decided to move on and discover restaurants and shops along the beach side. I found that the prices of clothes and accessories were 40times less than that in Bangkok. We moved on and then decided to go to Pattaya’s famous street called the “Pattaya’s Walking Street” where you could see the oozing nightlife of this city all accumulated on along the walking street full of restaurants, bars and night clubs. We took a Tuk Tuk from the beach for 10THB per head and reached this street in 25min. It was night but this street was galvanizing with high voltage lights and it seemed as if it’s almost day time. The view was amazing. We walked along the street where one could find people from all around the world gathered for every sort of entertainment and enjoyment. Some local agile kids were showing their gymnastic feats just in the middle of the street which attracted many people’s attention and money. Moving along the street we tried to find Halal food restaurants there were many, and after long search we chose an Irani restaurant. This resturant had a live Irani songs show and the dinner we had there is one of the memorable dinners in my life. After the dinner we took our way to our hotel as it was already too late and the day next we had planned for water sports and going to a famous Island named “The Tonglang Island ” beach of the KOHLAN ISLAND which is about 25min journey by Ferry from the Pattaya beach. Next day our journey to “The Tonglang Island” by ferry was again one of the memorable moments of our life. My first time experiencing the ferry boat was fascinating. The big waves in the sea hit the ferry and sprinkles of salty water came on us like showers of cool rain. As we reached the island it was full of tourists but the sea water was crystal clear a lot better than that at the Pattaya beach. The sight of the island was breathtaking with green mountains all around and aqua water in the middle one that I had always dreamt off or watched in movies or TV. But now it was in front of me and it was just as if a dream has come true. And as the famous poem of the John Keats ” A thing of beauty is a Joy forever; its loveliness increases; it will never pass into nothingness…” we also stuffed all the memories of this great journey in our eyes and got back to Bangkok the same night.